It’s not about the glow. It’s not about the show. It’s about the strong, brave & beautiful women that have tussled to survive Breast Cancer. It’s about those that lost the battle & those that continue to fight. The Sorbet Paint Pink Bag is our tribute to a collective cancer consciousness. 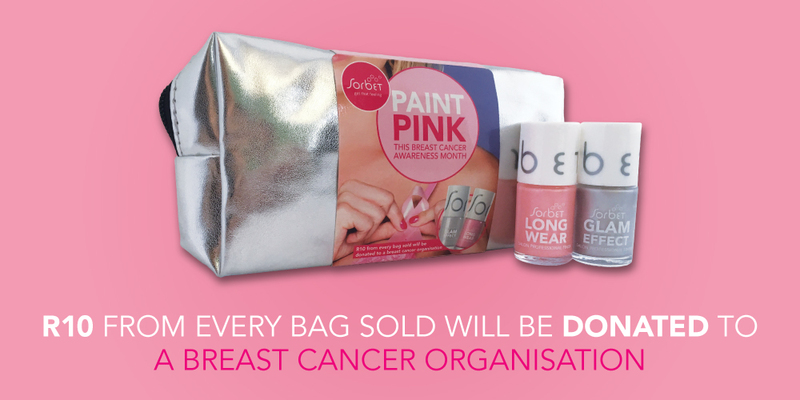 For every bag sold we will donate R10 to a breast cancer organisation of South Africa. Our ‘Paint Pink’ bag is your perfect feel good accessory. Buy it for yourself or for a loved one. Plus, give your hands a purpose & paint it pink for Breast Cancer Awareness. For only R189 your ‘Paint Pink’ Sorbet Bag comes with 2 Nail polishes from our brand new nail polish collection! Ts and Cs Apply- Sorbet has the rights to end this promotion at anytime! This special excludes any current specials & discount vouchers, promotion ends 30 October 2016!